I briefly mentioned the REN Clearcalm 3 clarifying clay cleanser in my blemish fighting skincare post but I wanted to devote a whole post to it as I really do love this product. As I mentioned in my previous post I was a little unsure about trying this as although my chin has it's oily moments the rest of my face is usually dry and dehydrated. So I wasn't sure if a product aimed at blemish prone skin would work for my whole face when it's only really my chin that is blemish prone. I read a few reviews that reassured me so I picked it up from Space NK around 6 weeks ago. REN's Clearcalm 3 range combats the three key causes of blemishes; excess sebum, bacteria and a build up of dead skin cells. It's an antibacterial and antimicrobial cleanser that cleanses and purifies, minimises pore size and gently exfoliates to improve skin tone and texture. I've only tried two full size REN products so far (and this is one of them) but I believe this comes in fairly standard packaging for REN. The tube is clear with the actual product in a clear bag inside the tube, so you can see when you're running low, and it has a pump dispenser. The product is just like a clay mask, thick and a light creamy colour. It also has a light clay type scent that I'm not a huge fan of but it's so slight you can barely detect it. It doesn't contain any scrubby bits to exfoliate the skin so I'm assuming this is achieved with acid exfoliation. You rub one pump of product between slightly damp hands and then massage it onto the face for one to two minutes. After I've massaged it around for a while I actually like to leave it on my face for a couple of minutes (I brush my teeth to pass the time) so it's like a mini face mask. I needn't have worried about using this on my dry/dehydrated skin. It leaves my skin feeling really clean and soft and I'm pleased to see that it also calms down any redness I'm suffering from. Any blemishes I have at the time also look calmer. It was only after I got this home and checked the ingredients that I realised it contains lavender (an allergy for me) but I haven't seen any negative effects from this. I've been really enjoying using this product but I have found that if I use it daily I do get through it a little too quickly for my liking considering it's not cheap at £19. I've now reduced how often I use it and tend to alternate between using this or my Magnitone. If I do suffer with a breakout I'll probably stop using the magnitone, as I'm really not sure about using it on blemishes, and switch to using this every night to help treat the breakout. 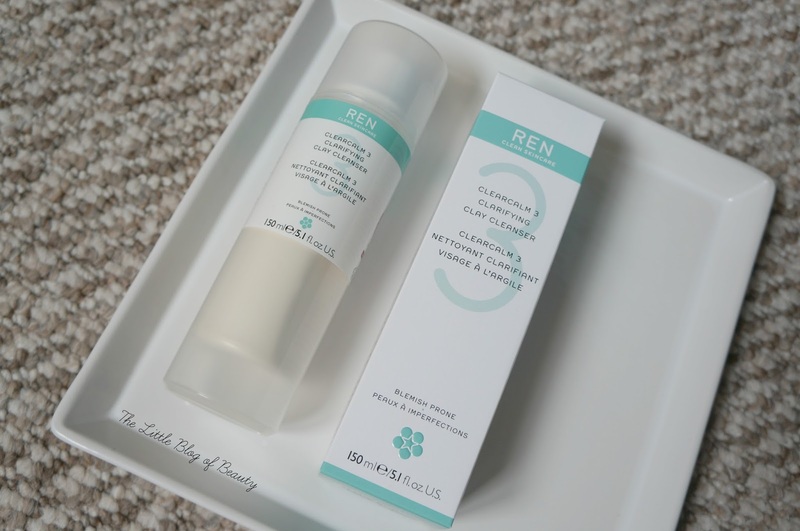 As I mentioned the REN Clearcalm 3 clarifying clay cleanser is £19 and you can buy this in Space NK stores and online. What REN products would you recommend? I love this cleanser, very calming. I agree I do go through this too quickly though as the pump does give a lot of product. I haven't tried any other REN goodies so will be looking at your comments to pick up some tips. I need to stock up on some REN products, there's so many I want I don't know where to start!